Summit meetings of heads of government have become ‘banal’ in today’s world. Yet they are a relatively recent practice that took off only in the mid-1970s. The aim of the book is to explore the origins of this new feature of global governance in its historical context. Why did heads of Western governments decide to regularly meet up in the European Council and the G7? What were they aiming at? How were these meetings run and what consequences did they have? How did other actors of international relations – states as well as non-state and/or transnational actors – react to this transformation? 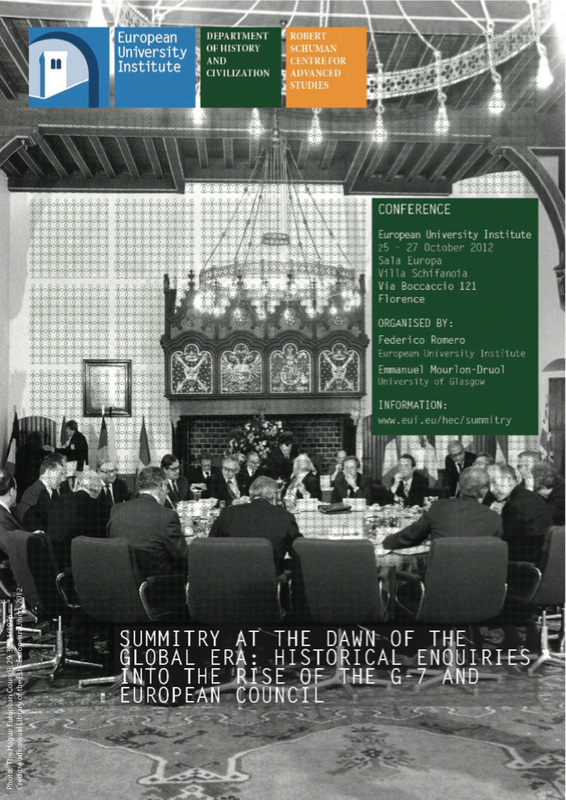 Based on newly released archival material, International Summitry and Global Governance investigates the rise of regular international summitry and its impact on international relations. The volume brings together the best specialists of this new field of historical enquiry in order to explore those features of global governance in their historical context, and open up an interdisciplinary dialogue with social scientists who have studied summits from their own disciplinary perspectives. Emmanuel Mourlon-Druol and Federico Romero (eds), International Summitry and Global Governance: the Rise of the G7 and the European Council, 1974-1991, (London: Routledge, 2014).